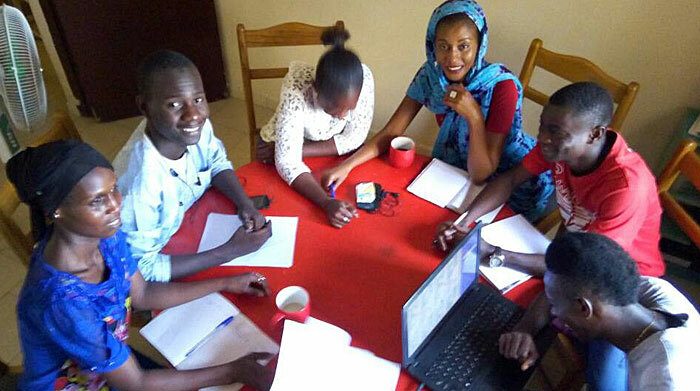 In July’s humid heat of Dakar, a group of young people met on three occasions to reflect on the thinking of “the man who declared war on poverty”, Joseph Wresinski, whose 100th anniversary is celebrated this year. To begin, they chose Father Joseph’s address to the young delegates who assembled at the International Labour Office in Geneva on the 25 May 1985 under the banner: “All our hands are useful in transforming the world”. Who are you? I am a human being. Where do you live? I live on earth. What are you doing? I am building the world. Joseph Wresinski’s call, through its universality, responds to the young people’s thirst for a more just world in which everyone is useful: “Father Joseph speaks of one single identity for all young people from all walks of life. There are some who have suffered and others who have a stable life, but he wanted to put everyone together, to unite us for the same struggle. He speaks of people getting together, not of one religion, nor of one ethnic group. He speaks of everyone together. Around the table, we come from different countries; we are citizens of the world. Father Joseph shows us the way to building a world where we are all useful. He talks about sharing fairly. This is a real issue and he has identified the poverty resulting from an unequal sharing “.